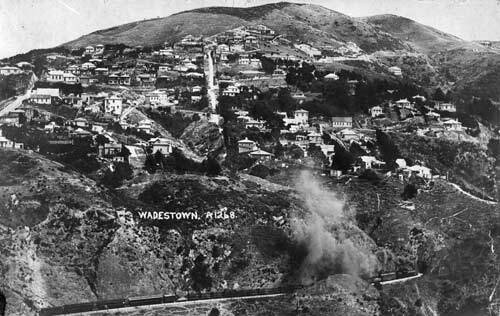 This view looks across to Wadestown, from Ngaio, around 1910. The street running up the middle of the image (Weld Street) is one of the steepest streets in Wellington. The suburb’s infant school is halfway up this street. In the mid-1880s the Wellington and Manawatu Railway Company cut through rock below the settlement to create its line to Longburn. This was the main trunk line out of Wellington until the 1940s. It is now the Johnsonville suburban line.